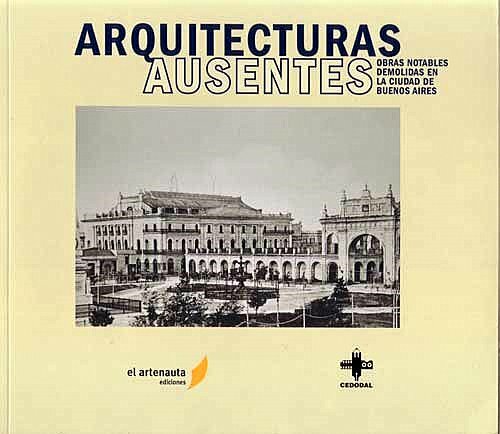 While browsing around a bookstore in San Telmo today I found a volume of photographs that fits perfectly with my City that Fades Away series: Arquitecturas ausentes: obras notables demolidas en la ciudad de buenos aires/Absent Architecture: Notable Works Demolished in the City of Buenos Aires. As one can expect, there’s quite a lot of Buenos Aires that is no longer with us. This book of over 100 black-and-white photographs was produced by Marcelo Kohan and the Centro de Documentación de Arquitectura Latinoamericana (CEDODAL) here in Buenos Aires. 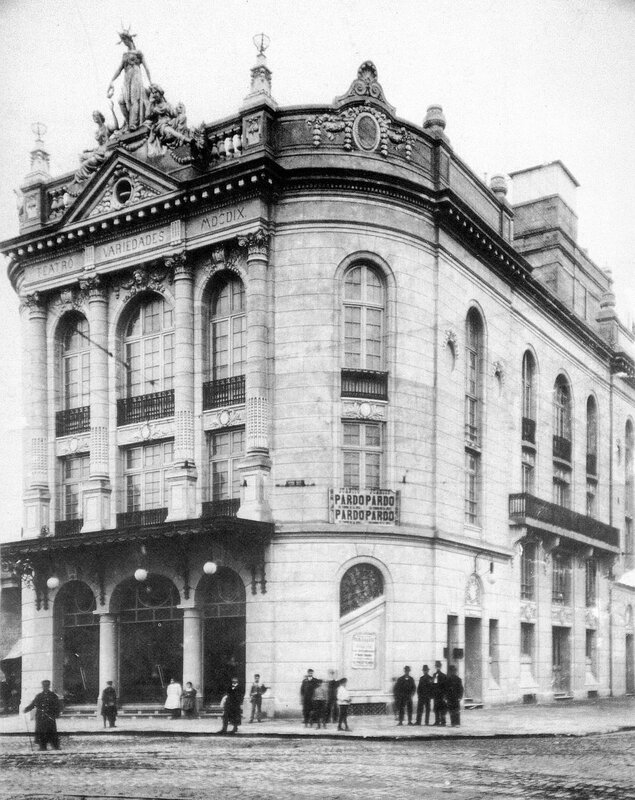 The cover image depicts the original Teatro Colón, then located just off of Plaza de Mayo. Each photo in the book includes the address and a short description of the building. There are some really remarkable works, including many images I’ve never seen before. For any fan of Buenos Aires architecture, this is one for your collection. Here’s a sample photo of Teatro Variedades that was located – where? – surprisingly, in front of Plaza de Constitución. Pick up a copy of the book to see the rest. For weeks I’ve been waiting for a shipment of books from the U.S. Finally, today, a notice arrived and that meant a trip down to Retiro and the international post office. The most anticipated volume in this shipment, what I look forward to soaking in day after day, is the one thousand plus pages of Walter Benjamin’s The Arcades Project . The entire book is simply snippets of Benjamin’s readings and his thoughts, an almost blog-like composition that Benjamin crafted while sitting in the Bibliotheque Nationale de France. The work is a curious intersection of philosophy, urban planning, architecture, sociology, and literature. Benjamin was fascinated by the arcades, passageways, of Paris and the ways those structures transformed Parisian society in the mid-1800s. The Arcades Project – just like any blog – is an unfinished work. Begun in 1927, Benjamin still hadn’t completed the work by his death in 1940, a suicide at the French-Spanish border as he attempted to flee Nazi-occupied France. It’s not clear what Benjamin’s intended behind the many pages of notes that editors later comprised together to form The Arcades Project, possibly notes for another work or simply his own occupation with a variety of thoughts. Originally written in German and French, the English translation was not published until 1999. Walter Benjamin was a great observer of urban culture. And in my own walks around Buenos Aires, I’m going to be lugging this volume (my edition is a 5 lb hardcover!) along some of my jaunts. It should make for fascinating reading and reflection while sipping coffee. I’m sure that it will not be the last book I will ever read. But, I probably could spend the remainder of my days perusing this volume. Besides, my book shipment also included W.G. Sebald’s The Rings of Saturn and Malcolm Lowry’s Under the Volcano . I bought this book used at a good price, the hardcover was no more expensive than a new paperback. But what I particularly like about buying used books is that they often come with an added surprise. And this one certainly did. I’ll blog tomorrow about that. One of my librarian friends back in the U.S. sent me a link to a project by the University of Chicago library: Late 19th- and Early 20th-Century Latin American Cities. Included are digital copies of 2 maps of Buenos Aires held by the University of Chicago Library’s Map Collection. Like all good online maps these days, these feature that nice zoom-and-pan tool. 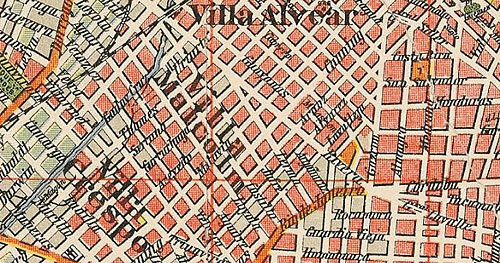 This map shows two barrios, Villa Alvear and Villa Malcolm, that have since been re-named as parts of Palermo. Personally, I like the older names. Since tango is not a part of my Buenos Aires experience (and I don’t really wander around this part of the city too much), I didn’t realize that there is a tango joint called Villa Malcom. And here’s some video of tango dancing at Villa Malcom. Colorful isn’t it? 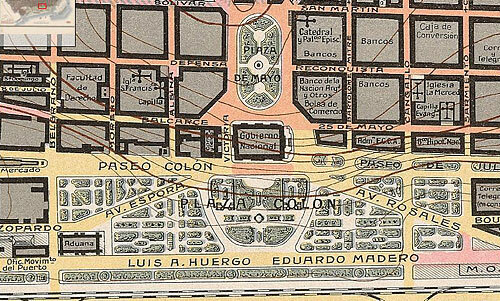 Plaza Colón looked very nice back in 1916. The map is quite extensive and covers the entire city, not just the downtown. Note the topographic contour lines showing the elevation. Ituzaingo is a quiet, shady street just beyond the southern edge of San Telmo. Nothing suggest this street as the source for a social movement in 1907 that mobilized 10% of the population of Buenos Aires. The strike started in September 1907 in one building where the rent increased by 47% in a single month. The strike then surged through San Telmo, including more than 750 buildings within a month. Working class tenants throughout the city joined the strike and more than 2,000 buildings – representing more than 120,000 people – had joined the movement by the end of 1907. Wages keeping track with inflation is always a problem in a growing economy, a topic familiar to anyone living in Buenos Aires today. By 1907 rents had been rising steadily for two years, yet wages were not increasing for many workers. A side note to this story: the two hundred block of Ituzaingo where the strike started no longer exits. Ituzaingo street now starts at the 500 block, the earlier parts of it were cut off by Parque Lezama and construction in La Boca. There are a number of fascinating studies about working class activism during this period of Buenos Aires history. A particularly detailed article is by James Baer, “Tenant Mobilizatin and the 1907 Rent Strike in Buenos Aires”, The Americas, Vol 49, Issue 3, January 1993, pp 343-368. The development of organized labor in Argentina, based on an immigrant workforce that brought both socialist and anarchist tendencies from Europe, is one of the primary forces that shaped the country during the 20th century. Much of the middle class in Buenos Aires today sigh in frustration over the antics of the labor unions and worker movements. But the historical origins of that populism is largely responsible for the eventual formation of the modern middle class in Argentina, a reminder that forces today are shaping the Argentina of tomorrow. One of my particular topics of interest is immigration to Argentina, particularly Eastern European, Jewish or Italian immigration but also from other countries (Irish, British, or I guess just about anywhere). I’m always interested in reading personal stories of immigration to Argentina. As I was browsing the bookstores on Corrientes yesterday, I came across a book that is a fascinating history of Italians in Argentina, appropriately named Historia de los italianos en la Argentina. The book (almost 500 pages) is a scholarly study of the topic by Fernando Devoto, a history professor at the University of Buenos Aires who for more than 25 years has been researching Italian immigration to Argentina. Yet, the book is still very readable and informative for anyone interested in this topic. The book starts with the early migration under Rosas but focuses on the height of Italian immigration to Argentina in the late 1800s and early 1900s. An entire chapter is devoted to the institutions of the Italians in Argentina, e.g, the mutual associations, hospitals, and clubs. 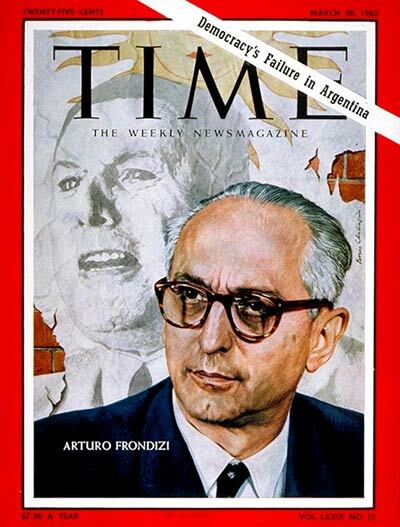 There are numerous short profiles of Italian-Argentine intellectuals, scientists, and professionals that contributed to the development of Argentina. Also, a section covers the role of Italians in the Argentine left, the workers movement, and anarchism. Later chapters cover the period between the two world wars (which includes a section on fascism and Italian communities in Argentina), and the last chapter is from 1945 to the present. Last night I only had time to browse through the book and read a few sections but I’m really looking forward to reading more of it. As I progress through the book, I’ll post a few bits of relevant commentary to the blog. But if you’re Argentine-Italian or interested in Argentine history, then this is a good book for your collection. I spent some time today playing around with a very cool interactive map of Buenos Aires developed by the city government. Warning: you can find yourself wasting a serious amount of time. By default the site will give you a street map with outlines for each lot. You can zoom around and focus in on detailed sections, just like other mapping tools. One obvious reason for the system’s creation was GIS-based management of property in the city. Select the option labeled datos inmobiliarios, then click on any lot and a pop-up window will display a photo and basic info about the building on that location (size, permitted uses, etc.). I often use the city’s Patrimonio site, which has its own features but the two geo-based services don’t yet seem to be linked together. There’s a lot of interesting historical data in the Patrimonio database and having these two systems linked would be handy….maybe that’s in the works for the future. I got very excited at the historic aerial photographs of Buenos Aires. This is a great way to see how the city has changed over the decades. (See my city that fades away series for more on that topic). I’ll have some future postings about specific buildings and places that I’ve observed have changed but for now let’s examine one of the most known (and destructive) changes in the city. A swath of the city was demolished for the construction of Av 9 de Julio. In the 1940 aerial photo below we can see that Av 9 de Julio at that time stretched only from the streets Tucuman to Mitre…rather tiny by today’s comparison. Notice how the 1000 block of Av de Mayo is still intact. But by 1965 Av 9 de Julio stretched as far south as Belgrano. (I’ll leave exploring the northern boundary of Av 9 de Julio for your own exploration in the mapping system). In 1940 the broad avenue had not yet swept into the southside of Buenos Aires. The area around Constitución station appeared fairly pleasant. Indeed, the house of a former president (Yrigoyen) of Argentina was located on the 1000 block of Av Brasil, the block pictured in this photo. So you have to use your imagination to picture what this part of the city looked like sixty some years ago, a neighborhood very different from today. But look at the 1978 photo. That very block has been replaced by a huge parking lot. And now passing over the parking lot is an overpass. I do have to say that the city is current working on improving this area around Constitución station and under the highway. There is still the parking lot but they are planting trees, bushes, widening the sidewalk and making it all appear nicer or, at least, as nice as you can make an area under a highway. The site loads very slowly but wait a few seconds and it should appear. Once it’s initially loaded then it operated at normal speeds for a mapping site. There is supposedly a way to link directly to the views within the interactive map of Buenos Aires but I couldn’t figure that out. (Thanks to the All Points Blog for mentioning the mapping site).